Background: Sirupeelai Samoola Kudineer (SK), a polyherbal decoction containing four medicinal plants has been used in Siddha system of medicine, practiced in Southern parts of India for the management of urolithiasis. Objective: The present study is carried out to scientifically validate the traditional claim and to study the mechanism of action of the drug. Materials and Methods: In the present study, anti-urolithiatic effect of SK was evaluated in Sprague-Dawley rats using ethylene glycol through drinking water and intraperitoneal injection of sodium oxalate. Renal damage was confirmed by the increased production of thiobarbituric acid reactive substance (TBARS). Results: Co-treatment with SK to urolithiatic rats for 21 days significantly prevented the elevation of renal and urinary stone biomarkers in plasma and renal tissue thereby preventing renal damage and the formation of renal calculi. Administration of SK at all doses and cystone restored the antioxidant (glutathione) levels by preventing the elevation of TBARS in the kidney tissue, which was further confirmed by histological sections. Conclusions: SK treatment promotes diuresis which leads to flushing of the renal stones and maintains the alkaline environment in the urinary system which probably mediates the antilithiatic activity. SK provides structural and functional protection to the kidneys by enhancing its physiological function against stone formation and validates its clinical use. Abbreviations used: SK: Sirupeelai Samoola Kudineer; TBARS: ThioBarbituric Acid Reactive Substances; SOD: SuperOxide Dismutase; GPx: Gluthathione peroxidase; GSH- Glutathione; LPO: Lipid peroxidation as measured as TBARS; AST: Aspartate AminoTransferase; ALT: Alanine Amino transferase; GGT: Gamma Glutamyl Transferase; LDH: Lactate Dehydrogenase. SK also provides structural and functional protection against ethylene glycol- induced renal calculus in rats as evidenced by histopathological studies. Urinary stone disease has afflicted humankind since antiquity and can persist, with serious medical consequences, throughout the lifespan of a patient. Urolithiasis known as Kal Adaippu in Siddha system of medicine is a common disorder found in humans of all ages due to changing lifestyle and dietary choices, leading to increased incidence and prevalence around the globe. It is a multi-factorial process caused due to an imbalance between the promoters and the inhibitors of renal calculi and finally may cause kidney failure also. About 75% of renal stones are composed of calcium oxalate crystals. Current modern medications include α-1-blockers and Calcium channel blockers and technologies such as percutaneous irrigation chemolysis and Extracorporeal Shock Wave Lithotripsy provide effective treatment. However, adverse drug reactions such as hemorrhage, hematuria, tubular necrosis, and subsequent fibrosis of the kidney are identified. Traditional medicines, mainly Chinese medicines and Indian medicines are becoming more and more popular as alternative and supplementary remedies over recent years because of its low cost and nontoxic nature. For centuries, a large number of herbal and herbo-mineral preparations have been used in traditional system of medicine and elsewhere which claim an efficient cure for urinary stones. These preparations are gaining importance in controlling hyperoxaluria and subsequent stone formation because of its minimal side effects. Sirupeelai Samoola Kudineer (SK), a decoction prepared by combining four herbs namely the whole plant of Aerva lanata, root of Crataeva nurvala, fruit of Tribulus terrestris, and root of Pavonia odorata is used therapeutically to treat urolithiasis in Siddha system of Medicine practiced in South India. Earlier whole plant of A. lanata, root of C. nurvala, fruit of T. terrestris, and root of P. odorata in the formulation of SK have been reported for their various biological properties such as antioxidant, diuretic and antilithiatic properties.,,, Even though the individual herbs have both scientific and traditional claim for their diuretic, antioxidant and calculus restraining property, there is no proper scientific data available for the antilithiatic property of SK formulation. Several models for inducing urolithiasis are available off late, to evaluate the drug response but they have some disadvantages such as hematuria, and mortality., In the present study, a modified induction methodology was adopted to induce urolithiasis using ethylene glycol and sodium oxalate to produce renal stone efficiently with lesser mortality. Therefore, in the present study, the antilithiatic potential of SK was scientifically evaluated against experimentally induced urolithiasis in rats using ethylene glycol and sodium oxalate and thereby also checks the attenuation of nephrotoxicity induced by ethylene glycol. Diagnostic kits were purchased from Accurex Biomedical Pvt. Ltd., Mumbai. Cystone tablet of Himalaya Drug Co., Bangalore was purchased commercially. All other chemicals used were of analytical grade purchased from SRL Mumbai. Male Sprague-Dawley rats (250–280 g) were obtained from Sri Venkateswara Enterprises, Bangalore. Animals were maintained at 25°C ± 2°C in 12-h dark/12-h light cycles, with both standard pelleted diet and water ad libitum in accordance to the CPSCEA guidelines. The experiments were carried after necessary clearances from Institutional Animal Ethics Committee of Sri Ramachandra University, Chennai, India. (Approval No: IAEC-XII/SRU/85/2008). A sufficient amount of dry raw materials of A. lanata (whole plant), C. nurvala (root), T. terrestris (fruit) and P. odorata (root) were obtained commercially from the local market in Chennai, Tamilnadu and authenticated by Prof. V. Jayaraman, Director, Plant Anatomy Research Centre, Tambaram. SK was prepared as per the methodology in Siddha texts., It is a decoction prepared by boiling the raw materials (each 5 g) with 8 parts of water (160 ml) and reducing to 1/8th (20 ml of decoction with a yield of 35 mg/ml). As part of the standardisation procedure, the quality of the plant material used were checked for any contaminants including toxic elements and is reported , Fresh decoction was prepared daily for oral administration. The dose of the SK was selected based on the proposed human therapeutic dose indicated (60–120 ml) in Siddha formulary , and practiced currently. The calculation was done on the basis of body surface area of human to rat for the conversion of human dose to rat dose. Earlier, we had screened the toxicity of SK; the results suggested that 4.5 ml/kg exhibited the No Observed Adverse Effect Level and was found to be safer. Hence, for the present diuretic activity and antiurolithiatic study, 4.5 ml/kg was taken as mid dose and from that one lower dose (3.0 ml/kg) and one higher dose (6.0 ml/kg) was chosen to be tested. The diuretic activity in rats was tested using standard protocols.,, The animals were starved and also deprived of food for 18 h before the experiment and were divided into five groups of animals containing six each (n = 6). Normal vehicle-treated rats (water) saved as Group I, whereas Group II animals were given a standard diuretic drug Furosemide  (30 mg/kg b. w) in order to identify if the test drug exhibited a similar mode of action, while SK was treated at graded doses to Group III, IV, V rats. Thirty-six rats were divided into six groups (n = 6/group). Normal rats (Group I) received water for 21 days. All the experimental animals except normal control received ethylene glycol (0.75%) in drinking water for 21 days and a single dose of sodium oxalate injection (35 mg/kg, i.p.) on 14th day for urolithiasis induction. Urolithiatic rats (Group II) served as positive control. Urolithiatic rats (Groups III, IV and V) co-treated with SK at a dose of 3, 4.5, and 6 ml/kg b.wt, p.o./day, respectively, Cystone co-treated rats (Group VI) at 500 mg/kg b.wt, p.o./day served as a standard drug-treated group. 24 h urine samples were collected by housing rats in individual metabolic cages on the 7th, 14th, and 21st day using sodium azide as preservative. Specific gravity, pH and volume, of the urine were noted immediately after urine specimen collection and stored at −80°C. At the end of the experimental period, on the 21st day blood was collected through retro-orbital puncture for further analysis followed by sacrifice of the animals and isolation of vital organs as per CPSCEA guidelines. Plasma was obtained from the blood withdrawn in a tube containing 0.2 ml of 11% trisodium citrate, after centrifugation and stored at −80°C for further analysis. The isolated kidney tissue was washed in saline, weighed and homogenised using phosphate buffer (pH-6.9). The supernatant obtained was used for the array of biochemical parameters. Aspartate aminotransferase (AST), alanine aminotransferase (ALT), alkaline phosphatase (ALP), gamma-glutamyltransferase (GGT), and lactate dehydrogenase (LDH), were analyzed in plasma and kidney tissue followed by urea, creatinine, uric acid and total protein estimation in plasma, urine and kidney tissue using Accurex kits, Accurex Biomedical Pvt. Ltd., Mumbai. Calcium, oxalate, inorganic phosphorus, and magnesium in plasma, urine and kidney were estimated using standard methods  Oxidative stress markers such as thiobarbituric acid reactive substance (TBARS), superoxide dismutase (SOD), glutathione (GSH), and glutathione peroxidase (GPx) were measured using standard methods in the kidney tissue. The kidney tissue obtained from all experimental groups (n = 4/group) were washed immediately with saline and then fixed in 10% buffered neutral formalin solution. After fixation, the tissue was processed and embedded in paraffin. Tissues (3–5 μm thick) were sectioned and stained with hematoxylin and eosin. These sections were then examined under a high power light microscope for the histoarchitectural changes and photomicrographs were taken for documentation. Bright white oxalate crystals were identified and counted using a polarizing microscope (Nikon Eclipse LV.100). All the results were expressed in mean ± standard error of mean. The data were statistically analyzed by one-way ANOVA followed by least significant difference using SPSS 10 version (IBM software, NewYork City, USA). P < 0.05 and < 0.01 were considered as statistically significant. The total urine output of the treated and control groups are given in [Figure 1]. Water intake was normal during treatment. The total urine output of the rats administered with Furosemide (30 mg/kg) and SK formulation were found to be elevated. 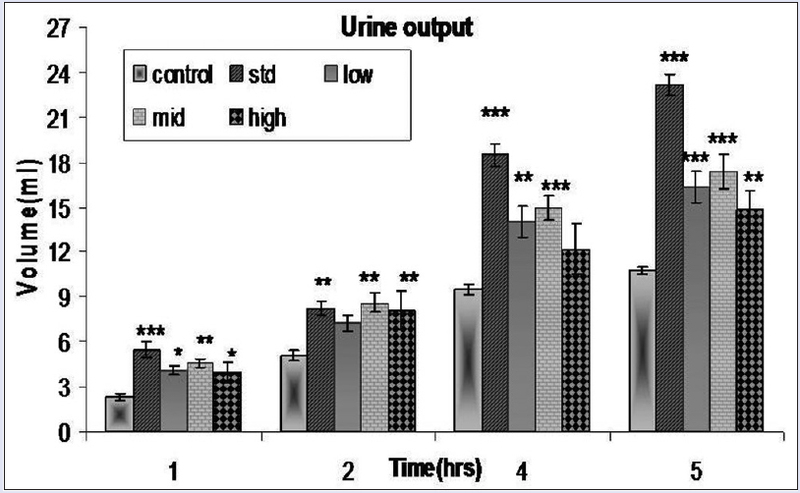 The rats which received Furosemide (30 mg/kg) excreted nearly two and half fold volume of urine as compared to the normal control rats (saline treated). The rats which received low (4.5 ml/kg), mid (9.0 ml/kg), and high dose (18/0 ml/kg) SK excreted nearly two-fold, two-fold, and one and half fold volume of urine respectively as compared to the control treated (saline treated). The color of the urine of rats in test drug and furosemide-treated groups appeared almost identical to that of the control group. Specific gravity (1–1.025 range) and protein (10 mg/dl) was found to be within normal limits. Qualitatively ketone bodies, nitrites, bilirubin, blood cells, sugars, and urobilinogen were not found in all drug-treated groups. pH of the urine was found to be slightly acidic in furosemide-treated rats as compared to the normal control saline-treated rats. The excretion of sodium and potassium was found to be increased and the Na +/K + ratio was found to be decreased in all test drug-treated rats and in furosemide-treated rats compared to the control rats and was found to be significant in furosemide (P < 0.05), mid (P < 0.01), and high doses (P < 0.001). However, there was no change in calcium levels. All the results were comparable with control, and the significant changes are shown in [Table 1]. Based on the findings of the preliminary standardization of renal stone induction in pilot study using ethylene glycol and sodium oxalate, the antiurolithiatic activity of SK was tested by identifying the changes in urinary stone markers, renal markers, stress markers, and histopathological findings which are discussed below. 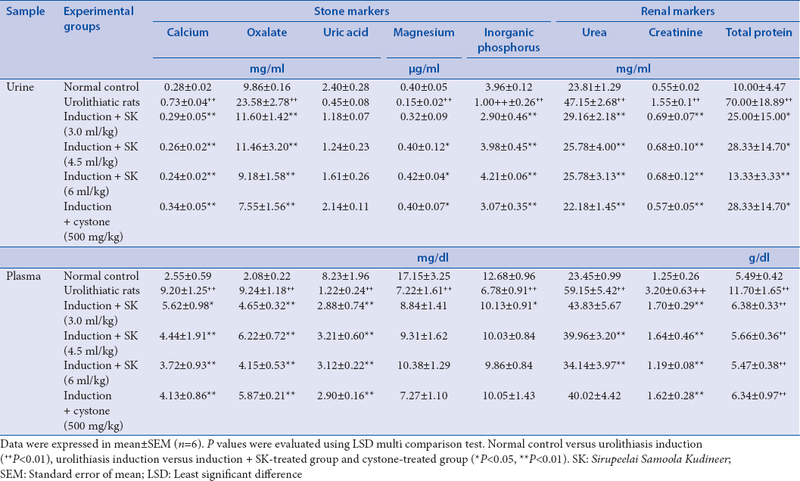 The stone markers mainly calcium and oxalate was significantly increased to about 4 folds in plasma, 3 folds in urine, and 4 folds in kidney tissues of urolithiatic animals when compared with normal controls [Table 2] and [Table 3]. Treatment with SK and cystone showed 60% and 69%, reduction in urinary calcium levels and 66.6% and 52% reduction in plasma calcium levels respectively. Whereas, calcium level in the kidney tissues were reduced to 68.2% and 51.14% in SK- and cystone-treated rats. Urinary oxalate level was found to be reduced on SK and cystone treatment (60.01% and 58%) respectively while they showed reduction in oxalate level of 55% and 44% in plasma and 41.21% and 45% in the kidney tissues, respectively. Contradictorily, the excretion of inorganic phosphorus, uric acid and magnesium in the urine and their levels in plasma and kidney were found to be decreased in urolithiatic rats [Table 2] and [Table 3]. The inorganic phosphorus in urine, plasma, and kidney was significantly reversed in all the test drugs treated rats while the magnesium levels were significantly reversed in urine and kidney but not up to the mark in plasma. Markers in renal functions such as urea, creatinine, and protein were augmented in urine, plasma and kidney tissues [Table 2] and [Table 3] of urolithiatic rats when compared to normal control rats. As calcium and oxalate, these levels were also considerably decreased by SK at all doses and cystone co-treatment. Similarly, the activities of marker enzymes such as AST, ALT, ALP, LDH, and GGT were found to be elevated significantly (P < 0.05) in both kidney and plasma of Group II rats when compared to normal Group I rats and the results are shown in [Table 4]. Simultaneous administration of SK and cystone maintained these levels to near normalcy compared to the urolithiatic rats. In the present study, stress marker lipid peroxide level (TBARS) was found to be increased significantly in kidney tissues of urolithiatic groups in comparison to the normal group. TBARS level in kidney tissue were significantly maintained to normal by all SK treated and standard administered groups when compared to induction group. Concurrently, renal SOD, GPx, reduced GSH level were significantly decreased in induction group whereas it is restored to normal by all SK treated rats and it was significant in high dose (SK)-treated groups. The results are shown in [Table 5]. Histopathological sections of normal rats showed normal renal architecture under light microscopy is shown in [Figure 2]a. Patchy renal tubular damage with congestion of blood vessels, severe glomeruli inflammation, and mild interstitial nephritis were seen in urolithiatic group [Figure 2]b. In SK co-treated group (3 ml/kg), there were few micro calculi with mild inflammation, mild interstitial nephritis, and patchy tubular damage (not shown). Likewise, in the SK co-treated animals (4.5 ml/kg, Group IV), less number of calculi with blood vessel congestion, inflammation, and mild tubular damage were seen (not shown). However, in SK (6.0 ml/kg) co-treated group, mild tubular damage with congestion of blood vessels was observed [Figure 2]d. In the cystone co-treated group, there was a calculus with mild inflammation and acute tubular necrosis [Figure 2]f. Under polarized microscopic examination, Group II rats exhibited many number of polarizing bright white oxalate crystals [Figure 2]c whereas SK and cystone co-treated rats reveal considerably lesser number of oxalate crystals [Figure 2]e and [Figure 2]g.
Hyperoxaluria is reported to be a more significant risk factor in the pathogenesis of urolithiasis which induces renal membrane damage resulting in calcium, oxalate, and protein leakages into the blood stream. The stone markers such as calcium, oxalate, inorganic phosphorus, magnesium, and uric acid play a vital role in the formation of stones., Diuresis reduces the risk of stone formation by reducing the saturation product of calcium oxalate. In the present study, the urinary output is increased in both drug-treated groups which implies the diuretic effect of the test drug thereby increasing urine output and reducing the possibility of stone formation. Ethylene glycol/sodium oxalate-induced rats (Group II) showed marked elevation in urinary stone markers such as calcium, oxalate, and protein and lowered the magnesium, uric acid, and inorganic phosphorus levels and also maintained slight acidity in urine implying successful induction. Increased urinary calcium and oxalate concentration might favor the nucleation and precipitation of calcium oxalate from urine causing supersaturation of urinary colloids which when trapped acts as a nidus, leading to subsequent crystal growth., These urinary stone markers excreted in urine and elevated in plasma and kidney during ethylene glycol/sodium oxalate administration was reversed by SK at all doses and cystone treatment. Magnesium and inorganic phosphorus are the potent inhibitors of stone formation, their elevation in drug treatment might reduce the supersaturation of calcium oxalate followed by decreased growth and nucleation rates of calcium oxalate crystals.,, Restoration of magnesium excretion by reduced excretion of oxalate and calcium by the drug decreases the supersaturation of the urine with respect to calcium oxalate thereby decreasing the risk of stone formation. Similar results were obtained when A. lanata and lupeol a flavanoid from C. nurvala were used as an antilithic agent against induction.,, Due to the obstruction of the outflow of urine by stones in the urinary system, the GFR gets reduced which leads to the accumulation of waste products, particularly nitrogenous substances in the blood stream. In the present study, the calculi-induced rats (Group II) showed a significant elevation in urea, creatinine, uric acid of plasma, kidney, and urine which confirms the renal damage. Similarly, treatment with SK and cystone significantly lowered the accumulation of these waste products in plasma as well as in the kidney and their elimination in urine thereby attributing the maintenance of the glomerular function. The liver is considered to be the major site of oxalate synthesis in the rat and role of the two enzymes-glyoxylate oxidase and LDH-have been well recognized. Ethylene glycol/sodium oxalate induction induces hepatic and renal cellular damage thereby altering the cytosolic enzymes levels (GOT, GPT, ALP, GGT, and LDH) in the liver and kidney. Most of the urinary enzymes originating in the kidneys are localized to specific regions and cellular components of the nephron. Studies pertaining to these enzymes will thereby showing the pathological status of the kidney. In the present study, renal injury was also evidenced by the increased activities of AST, ALT, LDH (renal tubular cytoplasmic enzyme), GGT (brush border membrane luminal surface enzyme), and ALP (brush border membrane enzyme). This might be due to the leakage of these enzymes into the general circulation from the collateral circulation., Administration of cystone and SK at all doses prevented the leakage of these marker enzymes and maintained its level in tissues in comparison to lithiatic rats. The results scientifically validate that the administration of SK and cystone against urolithiasis by preventing the elevation of marker enzymes, and urinary risk factors and proves its nephron protective and lithotrophic potential. The mechanism underlying this effect is unknown but is apparently related to increased diuresis and lowering of urinary stone forming constituents and attenuation of oxidative stress probably due to the phytoconstituents such as polyphenols, flavonoids, and tannins in the plant source. Thus, SK provides structural and functional protection along with antilithiatic activity against ethylene glycol and sodium oxalate-induced renal calculus in experimental animals and scientifically proves the use of SK in the treatment of urolithiasis in Siddha system of Medicine one of the oldest systems of Indian medicine. The authors acknowledge EMR scheme of CCRAS, Dept. of AYUSH, New Delhi, India for the financial assistance and Prof. S.P. Thygarajan Director (Research), Sri Ramachandra University for facilitating the research project. We acknowledge the staff and the members of Center for Toxicology and Developmental Research (CEFT), Sri Ramachandra University, India for their immense help in conducting animal studies at CEFT and Miss Vidhushini Sekar of Department of Biotechnology, Pondicherry University for preparing the manuscript. EMR grant of CCRAS, Ministry of AYUSH, Govt. of India (F. No. 5-29/2007/CCRAS/TECH/HQ/EMR-202 DT. 30.1.2008). Knoll T. Epidemiology, pathogenesis, and pathophysiology of urolithiasis. Eur Urol Suppl 2010;9:802-6. Xu H, Zisman AL, Coe FL, Worcester EM. Kidney stones: An update on current pharmacological management and future directions. Expert Opin Pharmacother 2013;14:435-47. Kumar A, Nair A, Reddy A, Garg A. Unique ayurvedic metallic-herbal preparations, chemical characterization. Biol Trace Elem Res 2006;109:231-54. Mukherjee T, Bhatla N, Aulakh G, Jain H. Herbal drugs for urinary stones-Literature appraisal. e JIM 1984;21:224-8. Mudaliar KSM. Siddha Materia Medica (Medicinal Plant Division). 7th ed. Chennai: Department of Indian Medicine and Homeopathy; 2003. Malini MM, Baskar R, Varalakshmi P. Effect of lupeol, a pentacyclic triterpene, on urinary enzymes in hyperoxaluric rats. Jpn J Med Sci Biol 1995;48:211-20. Meher S, Chaudhuri S, Marjit B, Mukherjee P, Ram A, Munshi S, et al . Nephroprotective action of Tribulus terrestris Linn and Crataeva nurvala Buchham in albino rats. Indian J Pharmacol 2001;33:124-45. Soundararajan P, Mahesh R, Ramesh T, Begum VH. Effect of Aerva lanata on calcium oxalate urolithiasis in rats. Indian J of Exp Biol 2006;44:981-6. Vidya L, Lenin M, Varalakshmi P. Evaluation of the effect of triterpenes on urinary risk factors of stone formation in pyridoxine deficient hyperoxaluric rats. Phytother Res 2002;16:514-8. Muthulakshmi V, Gayathri V, Ananthi S, Sundaram RL, Parameswari R, Thanka J, et al . Safety and bioactive potential of a traditional polyherbal formulation” Sirupeelai samoola Kudineer”. J Pharm Res 2010;3:2211-4. Gayathri V, Muthulakshmi V, Chandronitha C, Vasanthkumar M, Ramakrishnan G, Ananthi S, et al . 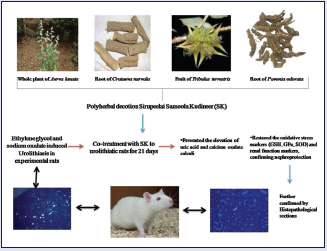 Toxicological evaluation of an antilithiatic polyherbal Siddha formulation–Sirupeellai Samoola Kudineer in experimental rats. Hum Exp Toxicol 2010;30:952-64. The Siddha Pharamacopoeia of India: Ministry of Health and Family Welfare, Department of Health; Government of India; 1992. Paget G, Barnes J. Toxicity Tests. Lawrence DR, Bacharach AL, editors. In: Evaluation of drug activities: Pharmacometrics. London: Academic Press; 1964. p 135-166. Lipschitz WL, Hadidian Z, Kerpcsar A. Bioassay of diuretics. J Pharmacol Exp Ther 1943;79:97-110. Murugesan T, Manikandan L, Suresh K, Pal M, Saha B. Evaluation of diuretic potential of Jussiaea suffruticosa Linn. extract in rats. Indian J Pharm Sci 2000;62:150-1. Rai S, Wahile A, Mukherjee K, Saha BP, Mukherjee PK. Antioxidant activity of Nelumbo nucifera (sacred lotus) seeds. J Ethnopharmacol 2006;104:322-7. Toma CC, Olah N-K, Vlase L, Mogośan C, Mocan A. Comparative studies on polyphenolic composition, antioxidant and diuretic effects of Nigella sativa L.(black cumin) and Nigella damascena L.(lady-in-a-mist) seeds. Molecules 2015;20:9560-74. Sheth U, Dadkar N, Kamat UG. Selected Topics in Experimental Pharmacology. In: Sheth UK, Dadkar NK, Kamat UG, editors. Pune, Maharashtra: Kothari Book Depot; 1972. Mendham J. Vogel's Textbook of Quantitative Chemical Analysis: Pearson Education India; 2006. Selvam R, Kalaiselvi P, Govindaraj A, Murugan VB, Kumar AS. Effect of A. lanata leaf extract and Vediuppu chunnam on the urinary risk factors of calcium oxalate urolithiasis during experimental hyperoxaluria. Pharmacol Res 2001;43:89-93. Gayathri V, Ananthi S, Chandronitha C, Ramakrishnan G, Sundaram RL, Vasanthi HR. Cardioprotective effect of Nerium oleander flower against isoproterenol-induced myocardial oxidative stress in experimental rats. J Cardiovasc Pharmacol Ther 2010;30:952-64. Ghodkar P. Chemical tests in kidney disease. Textbook of Medical Laboratory Technology. Mumbai, Maharashtra: Bhalani Publishing House; 1994. Halabe A, Shor R, Wong N, Sutton R. Effect of vitamin D3 on the conversion of ethylene glycol to glycolate and oxalate in ethylene glycol-fed rats. Clin Chim Acta 2003;330:135-9. Lemann J, Worcester EM, Gray RW. Hypercalciuria and stones. Am J Kidney Dis 1991;17:386-91. Schladt L, Ivens I, Karbe E, Rühl-Fehlert C, Bomhard E. Subacute oral toxicity of tetraethylene glycol and ethylene glycoladministered to Wistar rats. Exp Toxicol Pathol 1998;50:257-65. Ettinger B, Pak CY, Citron JT, Thomas C, Adams-Huet B, Vangessel A. Potassium-magnesium citrate is an effective prophylaxis against recurrent calcium oxalate nephrolithiasis. J Urol 1997;158:2069-73. Finch A, Kasidas G, Rose G. Urine composition in normal subjects after oral ingestion of oxalate-rich foods. Clin Sci (Lond) 1981;60:411-8. Anand R, Patnaik G, Kulshrestha D, Dhawan B editors. Antiurolithiatic and diuretic activity of lupeol. Ahmedabad, India: Proceedings of 24th and 25th Pharmacology Society Conference; 1991. Grases Fa, Genestar C, Conte A, March P, Costa-Bauza A. Inhibitory effect of pyrophosphate, citrate, magnesium and chondroitin sulphate in calcium oxalate urolithiasis. Br J Urol 1989;64:235-7. Sudhahar V, Veena CK, Varalakshmi P. Antiurolithic effect of lupeol and lupeol linoleate in experimental hyperoxaluria. J Nat Prod 2008;71:1509-12. Murthy M, Talwar H, Thind S, Nath R. Effect of pyridoxine on sodium glycolate-induced hyperoxaluria in rats. Biochem Med 1981;26:77-84. Guder WG, Ross BD. Enzyme distribution along the nephron. Kidney Int 1984;26:101-11. Srinivasan S, Kalaiselvi P, Sakthivel R, Pragasam V, Muthu V, Varalakshmi P. Uric acid: an abettor or protector in calcium oxalate urolithiasis? Biochemical study in stone formers. Clin Chim Acta 2005;353:45-51. Pacher P, Beckman JS, Liaudet L. Nitric oxide and peroxynitrite in health and disease. Physiol Rev 2007;87:315-424. Ali SS, Kasoju N, Luthra A, Singh A, Sharanabasava H, Sahu A, et al . Indian medicinal herbs as sources of antioxidants. Food Res Int 2008;41:1-15. Geetha T, Varalakshmi P, Latha RM. Effect of triterpenes from Crataeva nurvala stem bark on lipid peroxidation in adjuvant induced arthritis in rats. Pharmacol Res 1998;37:191-5.